Let the madness begin again. CARNIVAL OF MADNESS, the annual touring rock extravaganza, will make its roaring return with rock titans EVANESCENCE, CHEVELLE, HALESTORM and NEW MEDICINE. Kicking off Tuesday, July 31 in Springfield, IL, the 2012 trek will hit major cities across the U.S. including Boston, Baltimore, Atlanta, Nashville, Detroit, Chicago, Milwaukee and Pittsburgh (see full itinerary below). Select radio pre-sale tickets will be available beginning Tuesday, May 22; Carnival of Madness fan club members can begin purchasing tickets Wednesday, May 23; artist fan club pre-sales start Thursday, May 24; and general public on-sale begins Friday, June 1. Please note that Halestorm will be performing on the majority of the tour. 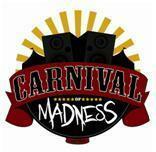 For more information on purchasing tickets, visit http://carnivalofmadness.com/. EVANESCENCE has sold more than 25 million records worldwide with more than 10 million in the U.S. alone. The band’s global, Top 10 hit singles “Bring Me To Life” and “My Immortal”–off their 2003 major-label debut Fallen (Wind-up Records)–led the group to two Grammy Awards (Best New Artist and Best Hard Rock Performance for “Bring Me To Life”). Propelling the band to sales of more than 15 million albums worldwide, Fallen spent over 100 weeks on Billboard’s Top 200 chart and was certified gold or platinum in over 35 countries. The band’s follow up was 2006’s The Open Door, which sold more than 6 million copies worldwide and spawned the hit “Call Me When You’re Sober.” In October of 2011, they released their highly anticipated third studio album Evanescence, which marked the band’s first album in five years and debuted at #1 on Billboard’s Top 200 album charts. The newly released album has spawned hit tracks “What You Want,” “Made Of Stone,” and “My Heart Is Broken.” Check out the video for “My Heart Is Broken” which has been viewed over 5 million times online: http://youtu.be/f1QGnq9jUU0. “We’re really looking forward to the Carnival of Madness tour this summer. We love Chevelle and haven’t hit the road together in years, and I’m really stoked to finally be playing some shows with Halestorm. Naturally I’m a fan of strong women in music and Lzzy’s voice is spectacular,” said front woman AMY LEE about the upcoming tour. EVANESCENCE is AMY LEE (vocals, piano), TERRY BALSAMO (guitar), TROY MCLAWHORN (guitar), TIM MCCORD (bass) and WILL HUNT (drums). For more information, please visit their website, www.evanescence.com. Platinum-selling alternative hard rock trio CHEVELLE—PETE LOEFFLER (Guitars, Vocals), SAM LOEFFLER (Drums) and DEAN BERNARDINI (Bass, Vocals)–released their latest and sixth full-length album Hats Off To The Bull (Epic Records) late 2011. The album debuted on the Billboard Top 200 Albums chart at #19 and is being hailed as one of the finest albums of the band’s long and successful career. The explosive debut single, “Face To The Floor,” dominated the rock charts, claiming the #1 spot at Active Rock for 13 weeks. With a hypnotic and grinding riff, the song rails against the corporate corruption of Bernie Madoff and Wall Street and is a testament to the band’s songwriting prowess and eternal knack for a hit. The Chicago group’s latest single “Hats Off To The Bull” is following the same trajectory, shooting up the Active Rock chart, currently occupying the #3 position. A newly released video for the title track can be seen here: http://youtu.be/4MRLd1Cgbdg. Pennsylvania quartet HALESTORM returned in April 2012 with their second full-length, The Strange Case of…. (Atlantic Records) after scoring two top 10 singles (“I Get Off” and “It’s Not You”) from their self-titled debut album and touring steadily with acts as diverse as Shinedown, Stone Sour, Disturbed, Megadeth, Papa Roach, Godsmack and countless others. Musically diverse and emotionally revealing, the album resonates with a newfound poignancy that takes HALESTORM–frontwoman LZZY HALE, drummer AREJAY HALE, guitarist JOE HOTTINGER and bassist JOSH SMITH–to a new level of creative achievement. The first single “Love Bites (So Do I)” is a storming rocker that illustrates frontwoman LZZY HALE’s individuality, sense of humor, and willingness to represent young women in today’s fast-paced society. The massive hit reached the Top Spot at Active Rock and is currently #2. Watch the official video here: http://youtu.be/FmkHqUwa4zg. NEW MEDICINE—JAKE SCHERER (Vocals), DAN GARLAND (Guitar), MATTHEW BRADY (Bass) and RYAN GUANZON (Drums)–injects a little hope into hard rock on their debut album, Race You To The Bottom (Photo Finish Records). Each song tells a story, whether it’s about the loss of a loved one on “Little Sister” or the state of the world on “Race You To The Bottom.” “Laid,” the album’s first single, examines relationship troubles with a combination of wit and wisdom. The song is a propulsive lovelorn rocker that sugarcoats nothing. Scherer, who co-wrote the song with producers S*A*M & Sluggo, reveals, “It’s about an experience with a girl who’s the ultimate wild child. She gets under your skin, drives you totally crazy and she’s gone.” Their latest track at radio, “Race You To The Bottom,” has gone on to sell over 11,000 copies and the video for the song, which recently debuted on AOL’s Noisecreep, can be seen here: http://youtu.be/VjxE2RTevMQ. For up-to-the-minute news on CARNIVAL OF MADNESS, visit http://carnivalofmadness.com/, http://www.facebook.com/CarnivalofMadness and www.twitter.com/carnivalmadness. This entry was posted in CARNIVAL OF MADNESS, Client Roster, Press Releases. Bookmark the permalink.